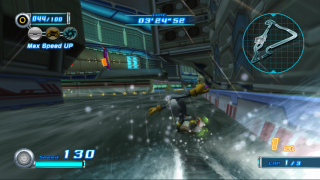 Tempest Waterway is the fifth level in the Babylon story of Sonic Riders: Zero Gravity. The shining sunlit canals of Aquatic Capital take on a decidedly less hospitable look during a nighttime storm, turning the placid streets into raging torrents. Bridges have been knocked down, with wreckage littering the wide aqueducts, and the bobbing gondolas are huddling under whatever protection they can find. Is it luck or skill? Storm has managed to get his hands on two more of the stones, somehow. Hurry and bring them back to Jet! Chased by Storm from MeteorTech Premises, through the Sparkworks, and finally across Aquatic Capital, Amy Rose is wearing down. Finally, she takes a different approach, taking out the Ark of the Cosmos that Storm so persistently wants and hurling it right at his head. Likewise exhausted - and now concussed - the tables have turned for the albatross, and he grudgingly agrees to help Amy find their way out of the watery city. The unlikely duo's partnership is brought to an abrupt end, however, when SCR-HD flies in out of nowhere and explodes on them. This is an indication of how Eggman and Babylonian technology do not really fit together like hand in glove; the possessed robot was searching for Amy's Ark of the Cosmos, but on finding it, the resonance with its own Ark overloads its systems. Storm loots the Ark from the robot and runs off to report back to Jet, very pleased with his good fortune. The mission here is not a race as such, as there are no opponents; Storm simply has to get out of the aquatic city within 4'00''. This page was last edited on 8 April 2018, at 08:53.